It's a slow news day, but Capcom did have one thing to announce. Sadly it wasn't Sengoku Basara 4. 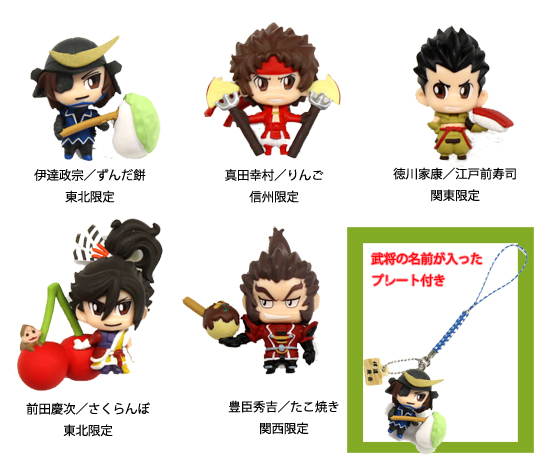 Instead, we're getting a tiny bit more Sengoku Basara merchandise in the form of gotouchi netsuke ('regional speciality charms'). The gimmick is that each is only available in a particular region of Japan, so collecting them all might be a little trickier than usual - although people with no sense of adventure can purchase them online from e-Capcom. This batch will be released in December. 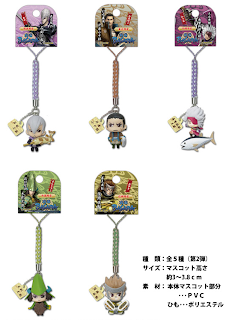 It includes Ishida Mitsunari with ayu sweetfish (Kansai region), Katakura Kojuurou with kamaboko (Touhoku), Chousokabe Motochika with katsuo tuna (Shikoku), Mouri Motonari with manjuu (Chuugoku) and Sarutobi Sasuke with oyaki (Shinshuu). Mouri almost looks as though he's wearing his manjuu. This is the second batch of these charms. The first set came out back in October. It featured Date Masamune with zundamochi (Touhoku), Sanada Yukimura with sliced apple (Shinshuu), Tokugawa Ieyasu with Edomaezushi (Kantou), Maeda Keiji with cherries (Touhoku) and Toyotomi Hideyoshi with takoyaki (Kansai). They're not the cutest designs, but I quite like the interesting release format. There are still some regional specialities I'd like to try one day.